"I'm pretty confident. It's not my first time getting to have fun with some ladders. There is a bit of uncertainty just to have competitors I've never been in the ring with, ever." "Conquering fears. I don't think everyone knows I'm afraid of heights, but I constantly challenge that fear every single time and then being in the ring with seven other superstars as well that have completed so many accolades and goals in their careers, and I'm just getting started it seems, yeah, that can be a little scary. But like I said, I'm ready to rise to that challenge, and it's not going to deter me from getting that Money in the Bank contract." "When I first started doing The Eclipse, I did it off the second rope. I was totally terrified to go to the top rope. 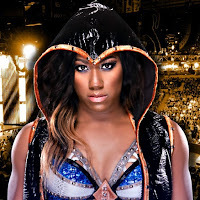 I remember going to [Booker T, one of her many trainers during her career], and he was like, 'Man, you really need to try to top that off the top rope.' I'm like, 'No, I'm cool. I'm cool on the second. This is my home right now. We're going to be good here.' And he talked me into doing it off the top rope, and it was so much more fluid as well because when you do it off the second you have to spin a lot faster 'cause you have to make sure you get around, but doing it from the top rope just worked."